Fishing for largemouth bass, smallmouth bass, spotted bass, channel catfish, flathead catfish, black crappie, white crappie, walleye, rainbow trout, bluegill, longear sunfish, warmouth, white bass and striped bass at Bull Shoals Lake in Missouri. For outdoor enthusiasts, the Bull Shoals Lake area is a great destination, whether for fishing, camping, hiking, vacation or simply a place to take the family for a weekend. Great bass fishing, crappie fishing, catfish and many other species are abundant. Lots of access and boat ramps in both Missouri and Arkansas. Be sure to add this 71,000-acre lake to your future fishing plans. 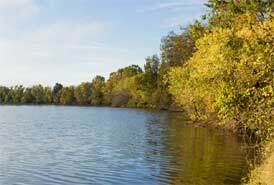 There is over 1,000 miles of shoreline, plenty of which is accessible for bank fishing. Bass boats, kayaks, canoes, pontoons and fishing boats of all kinds can get you to healthy populations of fish. Multiple marinas and boat rental options are conveniently located around the lake. Click here for a Arkansas Fishing License. Bull Shoals Lake in Missouri. Bull Shoals Lake in Missouri offers great fishing plus boat, jet ski, speed boat, bass boat, pontoon boat and houseboat rentals. Fishing at Bull Shoals Lake, in Missouri.